After reading the "Ultimate Guide to Email Image Blocking" and seeing all the great examples I decided to take matters into my own hands and get blocking! The following email is made of 229 individual images. And for fun, here are the slices for the glasses! I had a lot of fun making this and wanted to show it off to my fellow email enthusiasts! Now it's your turn though, created any fun emails lately? I (and the rest of the community) would love to see it! I would love to see the litmus test for this. How did it do in the outlooks? Outlook makes up a small percentage of our audience so that wasn't much of a concern for me. I will say it wasn't perfect though, I couldn't fix the scaling issues in the gmail app for android. 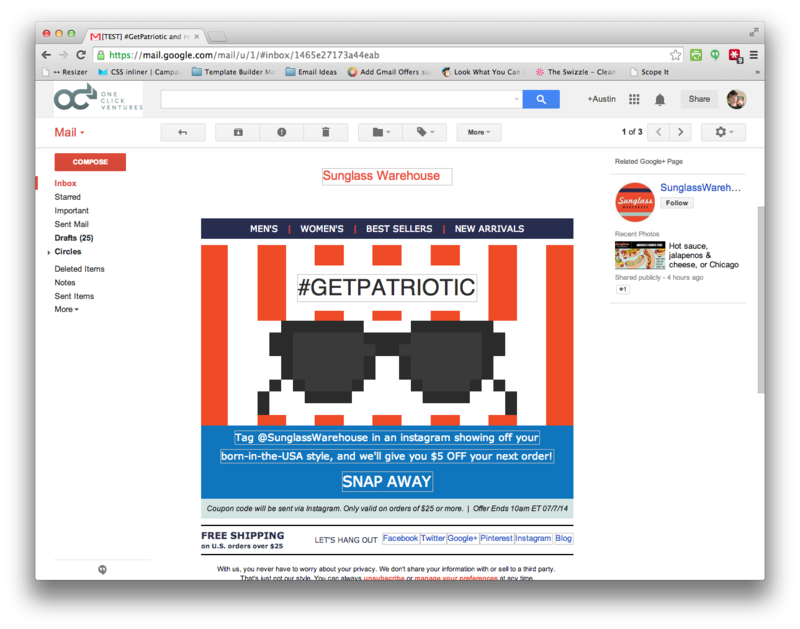 I was running into the same layout-scaling issue with Gmail App myself, while attempting to design a much simpler email. I managed to stumble onto a solution that forces the Gmail app to match the layout of the webmail view. The major drawback is that your text sizes are forced to scale down. As soon as I can narrow down the specifics of how I got this to work, I'll post it to the discussion boards. However, it seems like the hack relies on two tables with width=100% style="min-width: [insert desired margin]" surrounding the body table. Killer job on the image blocked view though! Wow. Nice work, Austin. Also curious to see your test results! 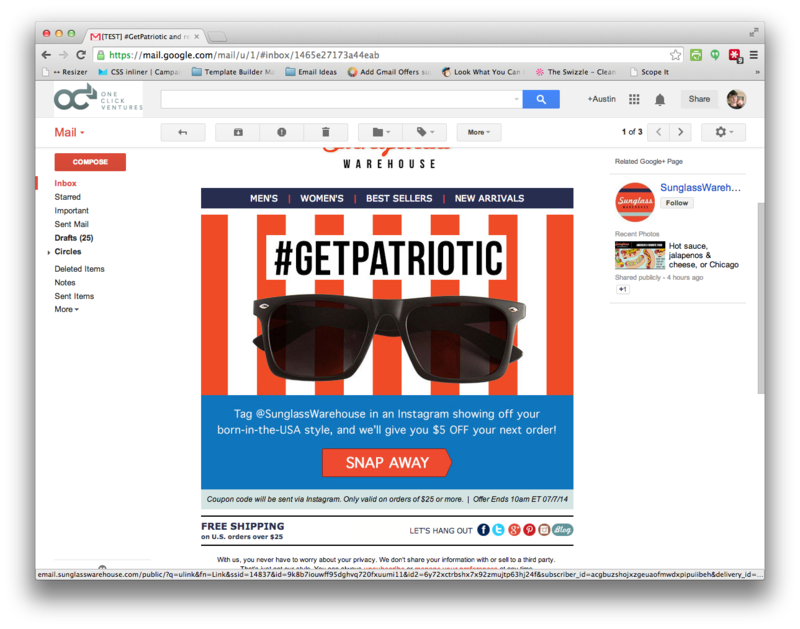 Good job, i'm just curious to know if this would pass spam tests with the sheer volume of images? I imagine Outlook isn't a big consideration for your audience? Correctamundo, outlook makes up a very small percentage of our audience. I've experimented a bit with designs like this, and I've had some designs that look great both with and without images enabled, but I'm never happy with how the email looks while it's loading. It's always a choppy piece-by-piece load that takes a lot longer than using a solid image. And while the images are loading, users can see the partial graphic that's being covered up by the image. I love the idea of the message and look coming through with images disabled, but I hate the idea of it coming at a cost to users who have images enabled by default. Great email. Yeah, I mean, the Outlook experience isn't perfect, but I don't think every email has to look perfect in every client. I think it needs to be readable, and the outlook version without images still looks good enough that I get the message and would want to click 'show images'. "Perfect is the enemy of good" as the proverb goes. Bravo! WOW! Amazing. How long did this single email take to do? Just curious. Also, how well did it hold up on smaller devices? It took about 4 hours to code and QA. Smaller devices is scaled down just fine except for gmail app which had some issues.